Procerin is recommended For men seeking faster results for hair regrowth, Procerin XT Topical Activator Serum should be applied directly to the scalp. Procerin XTs active ingredients block the vbinding of DHT to receptors on the hair follicle, and stimulate new growth in the crown and temple area. Procerin tablets and Procerin XT serum work together synergistically to reverse hair loss and help you regain your hairline. Shake vigorously before use. Apply 1ml to the affected and surrounding areas of the scalp twice daily. Gently massage into the scalp. Allow 10 seconds to dry, then style hair as usual. Do not wash hair for at least 4 hours. For best results use daily in conjunction with Procerin tablets. Includes Oleic Acid, Saw Palmetto Extract, Grapeseed Extract (Procyanidin Oligomers), Gamma Linolenic Acid, Pygeum Bark, Linoleic and Alpha Linolenic Acid, Stinging Nettle Extract, and Azelaic Acid. 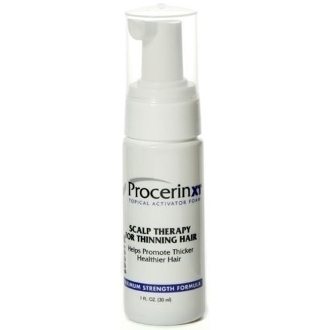 Procerin XT uses a complex blend of these vitamins and minerals to create a powerful DHT blocking solution that helps stop hair loss and regrow hair in areas of the scalp where hair loss has occured.